Lee Moore attacks at pace for Leamington in their 4-0 win over Oxford City. Brakes turned the form book upside down to brighten up a miserable afternoon in south Warwickshire and claim their first win in 11 Conference North games, writes Paul Edwards. That it should come so emphatically against a top-six side, and one of the highest scoring, made it all the more pleasing. There was an element of good fortune involved in the opening goal - something that has been in short supply this season. Surrounded by three defenders, Lee Moore nudged the ball into the centre and Jordan Goddard took two touches before firing in a low drive. The effort appeared to lack the power to beat Salva De La Cruz in the City goal but a deflection off Declan Benjamin ensured the ball beat the keeper and found the bottom corner of the net. Oxford moved the ball around well at times but were pressed back and denied space by a hard-working Brakes side. A long-range strike from Jose Lapoujade whistled past the post but it was Leamington who were looking the more threatening. Smart footwork from Newton and a superb pass out to Matt Dodd on the right saw the pacy wingman home in on goal but, having beaten his defender, he got his shot all wrong and the ball trickled through to the keeper. Oxford’s Paul Stonehouse had already been booked for a late challenge when he cut in from the left to take Anders Del Alamo’s pass past Ross Atkins but the officials spotted the use of his arm in doing so, and after momentary confusion as to which player he needed to speak to, referee Michael D’Aguilar produced a second yellow card to send the defender for an early shower. Leamington’s close pressing helped create their second goal, Stephan Morley feeding Goddard who in turn played in Dodd to calmly chip the ball over the onrushing De La Cruz and into net. 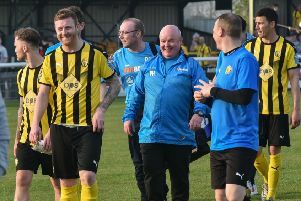 The goal provided Leamington with a cushion going into half-time and they continued in a similar vein in the second half, though it was Oxford who carved out the first chance, Adi Yussuf turning past Tank and firing against the legs of home debutant Atkins. This only proved to be a precursor to Leamington extending their lead, however. Moore’s neat backheel set Newton away down the left and the striker weaved past three defenders before seeing his shot kept out superbly by a diving defender. The loose ball fell kindly for James Fry, with the on-loan Birmingham City youngster driving home his first goal for Brakes. Leamington’s tails were up and two crunching challenges in midfield from Joe Magunda highlighted this. The ball was won back and Dodd charged forward once more. His cross was blocked and the ball fell to Goddard, whose deflected strike from the edge of the box whistled over the bar. As the weather worsened, Goddard charged clear after more tough challenges in midfield saw the ball run loose, but this time he shot wildly off-target. Newton then drove wide after more incisive forward play put him in a good position just outside the box. Great perseverance from Newton and Morley contributed to Fry’s second of the game on the hour-mark. Oxford simply could not get the ball clear, the defender arrowing his shot into the bottom corner past the despairing dive of De La Cruz. Brakes were not giving their opponents a second on the ball and Fry’s challenge in midfield won back possession again. Goddard then sent him scampering clear on goal but, with a hat-trick in his sights, he curled his shot agonisingly past the far post.